On February 3, 1962, the France left the port of Le Havre for its first crossing to New York, passing by the cultural centre inaugurated a few months earlier by André Malraux. 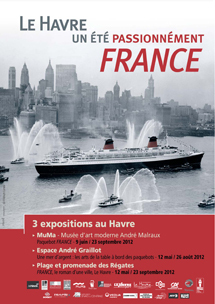 The ocean liner became a national legend, anchored in the history of Le Havre. A major historical and cultural phenomenon, the France exemplified the industrial ingenuity of the "Glorious Thirty", those three decades of economic prosperity in post-war France. It was also a symbol of the decorative arts of the 1960s, the evolution of society, and the changes in the merchant marine that marked the end of the transatlantic liners. Particular emphasis was placed on creating an inhabitable machine, decorated by great ensembliers such as André Arbus, Dominique, Jean Leleu, Maxime Old, Jacques Dumond and Marc Simon, and with works of art by Raymond Subes, ;Robert Wogensky, Jean Picart Le Doux and Picasso, among others. The exhibition also underlines the importance of Le Havre's maritime heritage, and the ties that bind it to the city's artistic heritage. The Musée d'art moderne André Malraux, an exact contemporary of the France, thus pays the ship a fine tribute, and returns with a special theme exhibition on its great predecessor of the 1930s, the Normandie.